A day after an under-construction flyover collapsed in the city leaving at least 24 dead, the police on Friday night arrested three top officials of a Hyderabad based company which was building the flyover and slapped murder charges on them. The 10 IVRCL detainees include a few engineers, managers and vice-president of the construction company, a Kolkata police official said. "We are questioning them to find out what went wrong before the flyover collapsed. Strict action will be taken against them," the officer said, adding that a police team has reached Hyderabad to meet the top bosses of the company. The state government on Friday suspended two engineers of the Kolkata Metropolitan Development Authority who were involved in the construction of the flyover. Agencies engaged in rescue work said that there was a possibilty of a person being trapped inside a truck which is still under a girder. 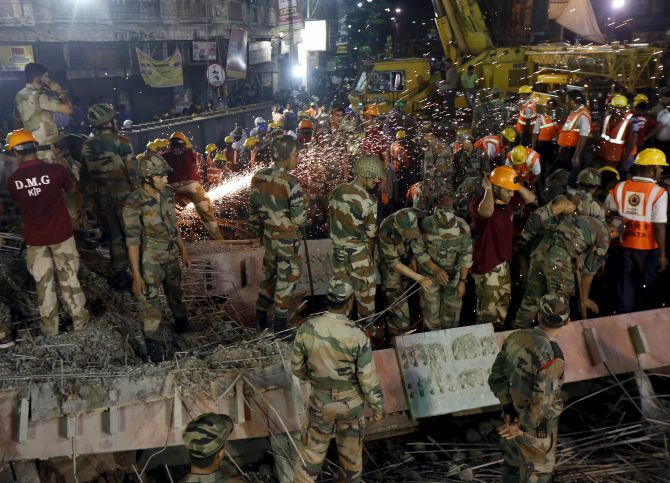 Armymen along with police, disaster management team, NDRF and fire brigade personnel engaged in rescue work throughout the night, pulled out three more bodies from under the rubble of concrete, a police officer said on Friday. 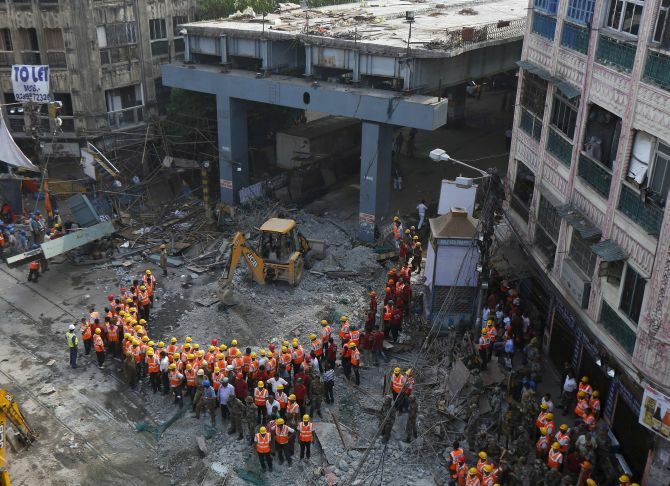 About a 60-metre-long stretch of the 2.2 km flyover under construction crashed down on Thursday afternoon on a congested road intersection in Kolkata. A day after an official of IVRCL dubbed the flyover collapse as an "act of God", IVRCL's legal team head P Sita said, "It is an accident". She also did not rule out sabotage. Showing a photograph of the mishap site published in a newspaper, she said that it looked like a site of bomb blast. There were various aspects which should be looked into. Sita also said, "...100 per cent no issues with regard to quality. It is the same material, as was used to construct the 59 sections earlier with approval, with which the 60th section (which collapsed) was built ... Unfortunately it collapsed." 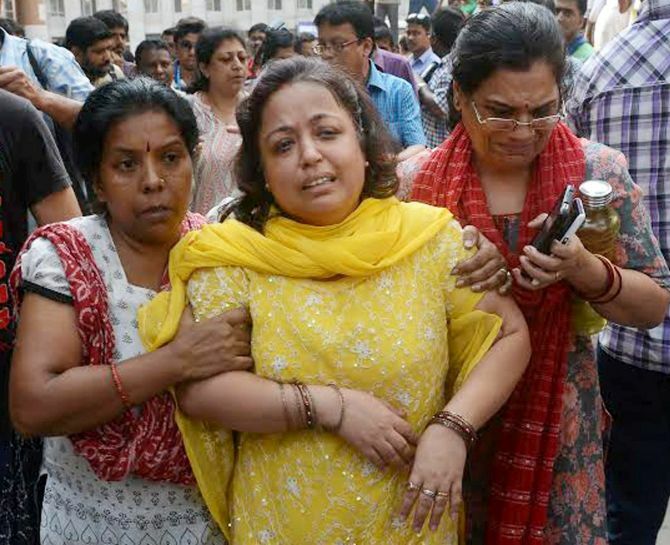 The West Bengal government has already ordered a high-level probe into the incident that triggered a blame game with the Opposition accusing the Mamata Banerjee government of callousness. Trinamool Congress and the BJP were engaged in a slanging match after Union Minister M A Naqvi accused the state government of "criminal negligence" in relief work, which the TMC described as "cheap politics". 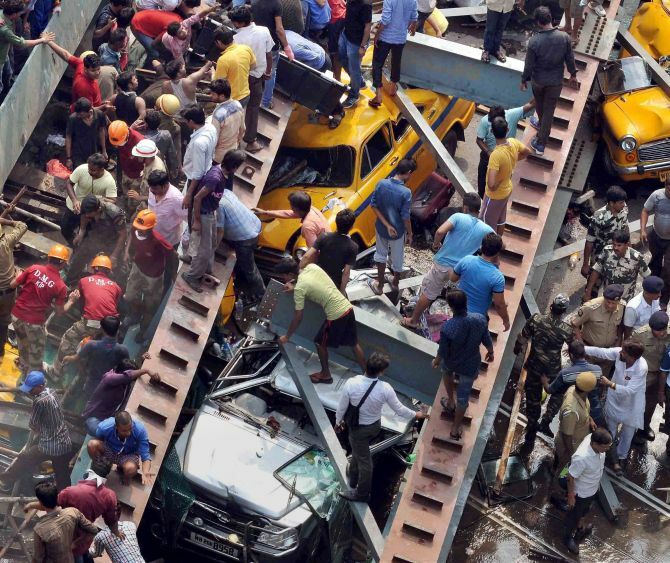 Naqvi, Union Minister of State for Parliamentary Affairs, said that the TMC government showed "criminal negligence" in ensuring relief work and engaging in a "competition on corruption" with the previous Left Front government which resulted in the flyover collapse. TMC national spokesperson Derek O' Brien termed Naqvi's statements as "cheap politics" in the election season. "Just saw a BJP Minister's statement. Reeks of cheap politics in election season. Army came at state's request. Army belongs to nation, not the BJP," Brien said. Naqvi also reiterated the party's demand for a CBI probe into the collapse. Meanwhile, a senior police officer said, "The main road crossing near Ganesh Talkies would hopefully be cleared by Saturday. But the rest like the iron piers, iron pillars, broken concrete parts will be cleared in a step-by-step process." KMDA had entered into a joint venture with IVRCL for constructing the 2.2-km-long Vivekananda Road flyover in north Kolkata. 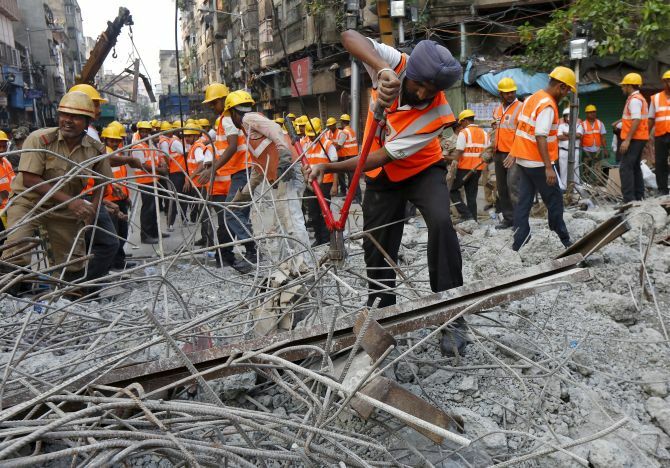 Rail Vikas Nigam Ltd has been assigned the task of removing the collapsed spans on Kali Krishna Tagore Road, the statement from state secretariat said. The statement said 62 families in neighbouring houses have been requested to vacate their premises temporarily to enable the safe removal of the collapsed span.